These are lyrics by Tommy James And The Shondells that we think are kind of funny. 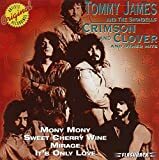 Tommy James And The Shondells', "I Think We're Alone Now"
He should double-check, just to be one hundred percent sure. And perhaps he meant "anyone else" around, because Tommy himself and the person he's with are certainly "anyone".